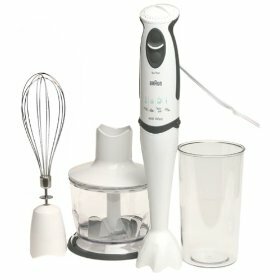 I have a confession: I cannot imagine life in the kitchen without my immersion blender, also called a hand blender. Of course, I use it for making smoothies, but its primary use is pureeing soups right in the pot. There’s no fear of burning yourself while transferring hot soup to a blender. Additionally, there is no blender to clean and you know how we flavoristas love efficiency in the kitchen. Immersion blenders are also good for small batches of pesto and for making vinaigrettes. There are several models out there ranging in price from $15 to over $200. My current immersion blender is a Cuisinart which is very decent. 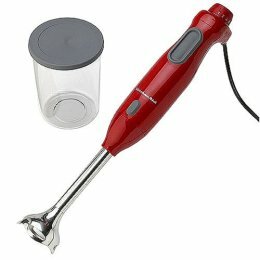 Recently, I was working in a remote location and had an immersion blender emergency: Mine died after 8 years of hard labor. Walmart was the only store around and I found my current model on sale for only $10.00. I am not sure how long it will last but I am hopeful because it has a 3 year limited warranty. Flavorista Note: Immersion Blenders are a fantastic piece of equipment but we do not recommend using them to crush ice for a smoothie or frozen drink. I tried it and broke mine. Perhaps some of the heavy duty, commercial immersion blenders could take on ice and win, but most home versions are not cut out for it (pun intended). We both like the Braun immersion blenders having used them at Odwalla and at home. The different speeds are useful and effective. Many brands offer lots of attachments which are fine if you will use them. If not, they just take up valuable kitchen space so select your immersion blender wisely. Happy purees to you!